TERRY EHRET has published several collections of poetry including Suspensions, Lost Body, and Translations from the Human Language. Literary awards include the National Poetry Series, California Book Award, Pablo Neruda Poetry Prize, and four Pushcart nominations. Lucky Break, her most recent publication, has been nominated for the Independent Book Sellers Award and the Northern California Book Reviewers Award as one of the best poetry collections of 2008. She is the co-founder of Sixteen Rivers Press, a shared-work publishing collective for San Francisco Bay Area poets. 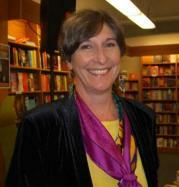 From 2004-2006 she served as poet laureate of Sonoma County where she teaches writing and lives with her husband.